Kalamata olives are known as a black olive, although they are actually dark purple in color. 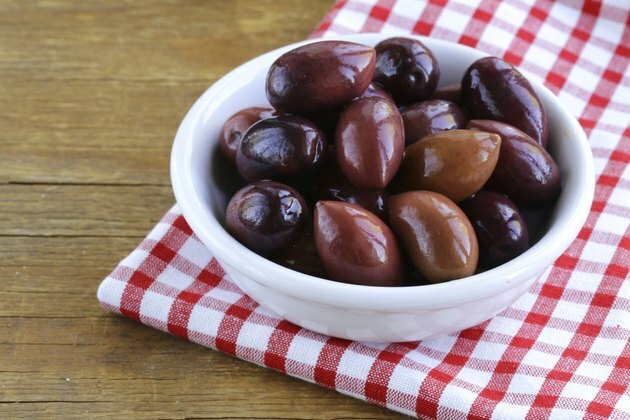 Native to Greece, Kalamata olives can be eaten plain or chopped up to be used in a dish. Made from fully ripe olives, Kalamata olives are marinated in olive oil or vinegar and are widely available in grocery stores. While Kalamata olives are high in sodium, they are also rich in healthy fats and contain a natural antioxidant. Kalamata olives are generally found canned, although specialty grocers may sell them directly from the barrel. A 4-tablespoon serving of Kalamata olives, roughly 8 large olives or 10 small ones, has 39 calories per serving, negligible amounts of protein, 3.6 grams of total fat and 1.1 grams of dietary fiber. Like other olives, Kalamatas are a good source of calcium, vitamin C, vitamin A, vitamin E and vitamin K, given its small serving size. Kalamata olives also provide some magnesium, phosphorous and potassium per serving as well as B vitamins. While Kalamata olives are high in fat considering their serving size, the majority of their fat is monounsaturated, also known as a "healthy" fat. A 4-tablespoon serving of Kalamata olives has 2.7 grams of monounsaturated fats, and 0.3 grams of polyunsaturated fats. The rest is saturated fat, and a serving contains no cholesterol. Monounsaturated fats may help lower your cholesterol level, reducing your chances of a heart attack or stroke, according to the American Heart Association. They are considered healthy when eaten in place of saturated or trans fats. While generally healthy, Kalamata olives are high in sodium, largely due to the canning and preservation process. A 4 tablespoon serving of Kalamata olives has 247 milligrams of sodium. While this is only 11 to 16 percent of the recommended upper intake for sodium, the percentage is quite high when you consider the small serving size. A diet high in sodium increases your chances of developing high blood pressure and osteoporosis. Limit the number of olives you eat or look for low-sodium Kalamata olives, which can sometimes be found in health food or specialty grocery stores. Olives, like olive oil, contain phenolic compounds, which are natural antioxidants. It is this compound that gives olives their distinctive taste. Phenolic compounds in olive oil was a strong antioxidant, protecting your body from damage from environmental toxins as well as free radicals, according to a 2002 issue of "Medicinal Research Reviews." The phenols may also be the reason for lower incidences of heart disease and some cancers for those who eat a Mediterranean diet high in olive oil and olives. In 2011, "Current Pharmaceutical Design" published a review and study where they concluded that oleocanthal, one of the phenolic compounds of olive oil, has strong anti-inflammatory properties. Scientists determined that a diet of regularly consuming olive oil and olives had reduced incidences of chronic inflammation.